BERKELEY, California, Mar 2 2012 (IPS) - Shawn Deez, a freshman in peace and conflict studies, says she thinks she knows why some classes are scheduled at the University of California, Berkeley, and some are not. It’s corporate influence that makes the difference, she said. It was Mar. 1, Occupy Education’s National Day of Action, observed with marches and rallies at some 30 California universities and at a number of venues around the country. While much of the media focused on the steep tuition hikes at state universities and community colleges, many participants at UC Berkeley used the lens of the Occupy Movement – the 99 percent versus the one percent – to examine the underlying problems in education. Deez spoke to IPS during a downpour while waiting for a noontime rally on the UC Berkeley campus. She contended that the influence of corporations such as BP – formally British Petroleum – which has partnered with the university and its affiliated laboratories on a 400,000-dollar biofuels institute, heavily influences the departments in which university funds are spent. She said the humanities have no corporate funding and face increasing cuts. Moreover, she said, corporate interests have turned the university away from its mission. In Philadelphia, there were simultaneous rallies at Temple University and the University of Pennsylvania, after which the two groups converged at the governor's office and then marched with unions to protest public school closings and layoffs. "The day was specifically Occupy, because, like the encampments, it brought together a number of different people representing a number of different causes, demonstrating their collective struggle under a broken system," Ethan Jury, a Temple University senior who helped coordinate the Mar. 1 events, said in an email to IPS. "Federal and state budget cuts maintain private over public interest, and reveal the links between increased funding for prisons, corporate tax loopholes, and the exploitation of the environment (that) are directly tied to tuition hikes, public school closures, layoffs and the defunding of public services." There were similar rallies in at Ohio State University, the University of Minnesota and in Washington D.C., Boston and New York. According to the syndicated news magazine Democracy Now!, the protests in New York city were intensified by the anger of educators criticising Mayor Michael Bloomberg's administration for releasing the names of 18,000 city teachers and a ranking system that claims to quantify each teacher's impact on statewide test scores. And then there’s the question of who profits from the steep tuition hikes. Banks have been frequently targeted by the six-month-old Occupy Movement, for their bad home loans and foreclosures. But University of California, Davis instructor Joshua Clover explained to the Berkeley crowd of around 300 how banks profit from the hike in their tuitions. After that, the banks control the debtor’s lives. “This is the outcome of the university’s laying down with capital,” he said, telling the students that the answer isn’t a “kinder, gentler capitalism”, but an end to the system. Before the rally, “teach-outs” were held in small groupings around the campus. Matt Williams, a senior in sociology, led one on affirmative action. UC Berkeley statistics for 2010 show there were just four percent African American and 13 percent Latino undergraduates. He said that part of the problem is the different quality of high schools, where some schools offer advanced placement classes in which a student can earn 4.5 points (an A is four points), and where counselors steer students into college preparatory classes and even help students write their entry essays. Donnell Vital-Gibson, an eleventh grader at Oakland Technical High School, was listening to the speaker on affirmative action and talked to IPS afterward, explaining that he was one of the lucky ones in Oakland. His high school has advanced placement classes, he said, but schools in Oakland’s poorer neighbourhoods do not. “We’re fighting the one percent right here,” he said. 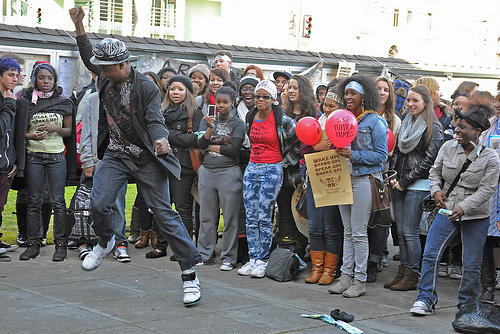 After the rally, the students took off on a march to Oscar Grant/Frank Ogawa Plaza, the former home of Occupy Oakland, to meet up with community college students and others from Occupy Oakland. Then some 60 among them marched again, heading to a church in Richmond, about 12 miles away, where they would join students from San Francisco, spend the night at a church, then walk 99 miles over several days, to UC Davis, near the state capitol in Sacramento. They are planning “Occupy the capitol,” a statewide education rally in Sacramento Mar. 5. “The march is a way to engage the community,” said Stephan Georgiou, a student at San Francisco City College, a community college where 67 classes were cut this year. Georgiou said they’re facing the “dismantling of community colleges in California,” and that people are not aware of the programme cuts and layoffs. Around the time Georgiou was marching from Oakland to Richmond, 13 demonstrators were arrested in San Francisco for refusing to leave a state office building until their demands for education funding were met. A City College engineering instructor was among the arrestees. The “tax the rich” refers to a proposed “millionaires tax” that will be on California’s November ballot, if its supporters collect the required signatures. It would levy an additional state income tax of three percent for Californians whose annual adjusted gross income is over one million dollars, and five percent for those making over two million dollars a year. The funds would restore budget cuts to education, public safety, and other services. The California Federation of Teachers is backing this measure. Berkeley High senior Amelia McCrea spoke to the crowd, calling for the millionaire’s tax and asking: “Doesn’t the government realise that someday, we’re going to be running the show? McCrea continued, “I believe that students should be recognised as a priority over the funding of prisons,” and then she invited the audience to enjoy the dance performances and music provided by fellow students.